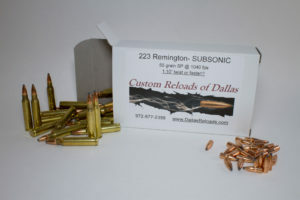 223/5.56 SUBSONIC round (priced per 100 rounds). Once-fired LC brass, Hornady 55 grain SP (soft point) @ 1030 fps. This ammo is loaded to SUBSONIC speeds out of a 16″ barrel. This ammo will NOT cycle an AR-15. This ammo is designed for 1:10″ twist or faster (1:9″, 1:8″. 1:7″. etc). If you have a 1:12″ twist, you will need to check bullet stability first before shooting through a suppressor. 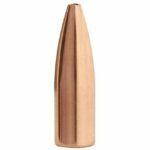 The 55 grain SP bullet is marginally stable in a 1:12″ twist barrel at subsonic speeds, and should not be shot in any slower twist rate. This ammo will NOT cycle an AR-15. If you are zero’d at 100 yards with normal full power supersonic 223 or 5.56 ammo, your point of impact (POI) with the subs will be about 9″-12″ low at 100 yards. 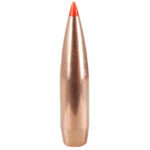 Why use a 55 grain SP (soft point) flat base, instead of a BTHP, VLD, polymer tip or match bullet? When shooting at subsonic speeds, bullet stability becomes a huge factor for the bullet to properly stabilize and for it to shoot well. Bullet length is a major factor in how stable it is out of the muzzle. In a given twist rate (like a 1:10″ or 1:9″ barrel twist) and slow subsonic speeds, a shorter, flat base bullet is more stable than a longer BTHP or VLD match bullet. 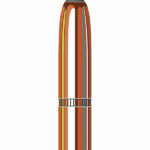 The 55 grain SP flat base is a much shorter bullet than a similar weight 55 V-max or BTHP design. This allows the 55 grain SP flat base to be more stable and have the potential to be more accurate at subsonic speeds than a BTHP design. BC (ballistic coefficient) is for supersonic flight, and does not matter at subsonic speeds. Having a high BC bullet at subsonic does not benefit the shooter at all. 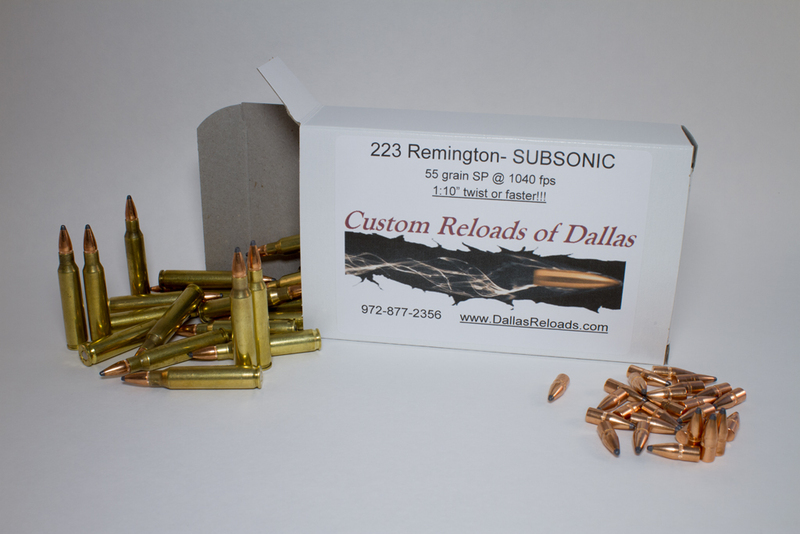 This is why the 55 grain SP flat base bullets work well as subsonic round! Bullet Trajectory- Distance is in Yards and drop is in inches.